Why Was The Watchtower Disassociated From the United Nations? In October, 2001, a British newspaper called, The Guardian, revealed that the Watchtower Society had voluntarily been associated with the United Nations as a Non-Governmental Organization (NGO) for close to a decade. What makes this so revealing is the fact that the UN and its predecessor, the League of Nations, has for the last 80 years been condemned as an abominable and detestable thing by the Watchtower. For example, in the Society’s 1999 publication, Pay Attention to Daniel’s Prophecy!, page 269 says, "What 'disgusting thing' has been 'put in place' in modern times? Apparently, it is a "disgusting" counterfeit of God's Kingdom. This was the League of Nations, the scarlet-colored wild beast that went into the abyss, or ceased to exist as a world-peace organization, when World War II erupted. (Revelation 17:8) 'The wild beast', however, was 'to ascend out of the abyss.' This it did when the United Nations, with 50 member nations including the former Soviet Union, was established on October 24, 1945. Thus 'the disgusting thing' foretold by the angel - the United Nations - was put in place." This is in harmony with several older publications such as the 1991 book, “The Greatest Man Who Ever Lived”, which says on the 3rd page of section 111, “Another part of the sign that Jesus gives is the appearance of the ‘disgusting thing that causes desolation’....In the major fulfillment of the sign, the disgusting thing is the League of Nations and it’s successor, the United Nations”. On October 8, 2001, Stephen Bates, a journalist from The Guardian wrote an article titled, “Jehovah’s Witnesses Link to UN queried”. (click here to read) In it, Bates exposes the Watchtower’s surprising involvement with the UN, especially when, to be granted status, organizations must show that they share the ideals of the UN’s charter. 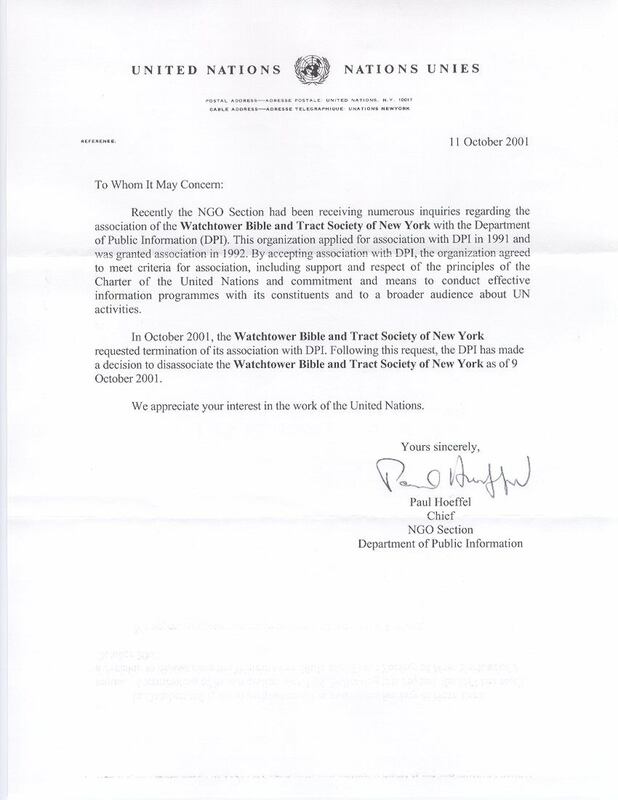 In a follow up article on October 15, 2001, (click here) Bates writes, “The Jehovah's Witnesses have hurriedly disaffiliated from the United Nations within days of a Guardian story in which members accused the sect of hypocrisy for supporting an organisation it has repeatedly denounced privately. After the article last Monday, the organisation's New York based hierarchy pre-empted a UN inquiry by agreeing to dissociate the Witnesses from an organisation which it holds to be the scarlet beast named in the Book of Revelation.” The article goes on to say that initially the Watchtower tried to play down or deny the evidence, and that those who were bringing the facts to light were being accused of apostasy. Following an inquiry, the United Nations sent out a fax on October 11, 2001 (click here) verifying that the Watchtower did apply for association with the UN’s Department of Public Information (DPI) in 1991, and was granted association in 1992. It also verifies that the Society, by accepting association, “agreed to meet criteria for association, including support and respect for the principles of the Charter of the United Nations....”.